As I sit here in my little kitchen staring at a pile of dirty dishes, with the lingering scent of vegetable oil swirling in the air from the fan overhead, I’m wondering if I did the right thing. Should I have just made a classic mac and cheese recipe instead of a pimiento mac and cheese? Should I have even attempted to make pimiento cheese, a food I’ve only eaten once in my lifetime? Should I have taken a perfectly good batch of mac and cheese and fried it? And as my doubt swirls as much as the smell in the air, I’m going to share my resolute response with you: Yes, to everything above. It was the right choice to make fried pimiento mac and cheese. After all, how could a virtual baby shower for one of my greatest blogging friends, Josie of Pink Parsley, the self-proclaimed lover of pimiento cheese, be complete without some of this standard Southern fare? How could I not try my hand at Southern food, even if I am a Yankee? At our get-together dinner the night before BlogHer Food ’11, I experienced not only pimiento cheese for the first time ever, but also fried okra, both at the not-so-subtle urging of Josie, Branny, and Courtney. I was totally hooked on pimiento cheese and after an arduous struggle over what to make for Josie’s baby shower, I decided to incorporate two of Josie’s favorite foods together into pimiento mac and cheese…and then to fry it. I scoured 4 or 5 different recipes that included pimiento cheese, including a few of Josie’s own recipes as well as a pimiento mac and cheese recipe. Then I jotted down a few notes about ingredients, how I wanted to go about making the recipe (i.e., adding homemade pimiento cheese to a bechamel sauce vs. making a bechamel sauce and adding separate ingredients), tweaked the recipe a little here and a little there, and came up with a pimiento mac and cheese recipe that I’m proud to share with you. I’ve tested this recipe a couple times (and actually have made it both ways as mentioned above) and will suggest that in order to fry the mac and cheese, you’ll want to make sure the final mixture is a little on the creamy side in order to form balls out of the chilled mac and cheese without them crumbling apart. 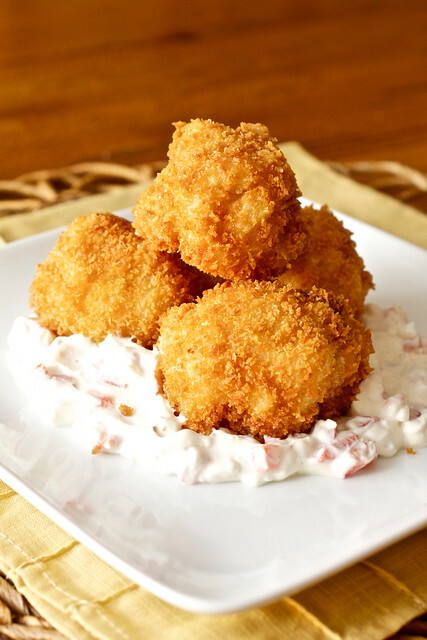 The recipe below will yield enough mac and cheese for about 18 fried mac and cheese balls or 4 servings for a main course – adjust the measurements to your needs. Kyle and I both loved this mac and cheese (both in the indulgent fried form and in a baked form for dinner one night) and in spite of adapting a few recipes to make this dish worthy of a true Southerner, I am confident that I have succeeded. Josie has been a very dear friend and after spending a few days with her in Atlanta in May, I can honestly say that you’ll be hard-pressed to find a more sincere and generous person or blogger or a more loving and dedicated mom to Caroline. I’m hoping that after baby Pink Parsley is born next month that we’ll be able to get together again soon! Josie – I hope my Yankee fried pimiento mac and cheese puts a smile on your Southern face today and I can’t wait to meet your new little boy! Party planner extraordinaire, Annie of Annie’s Eats, has put together a fantastic line-up of bloggers to celebrate the upcoming birth of Josie’s little boy so be sure you check out both Annie’s and Josie’s blogs for the links to all of the recipes included in this virtual baby party. Bring a large stockpot of water to a boil and cook elbow macaroni according to package directions. Drain. Meanwhile, in a 3-quart saucepan or Dutch oven, saute bacon over medium-high heat until browned and almost crispy, rendering as much fat in the pan as you can. Using a slotted spoon, remove the bacon from the pan to a paper towel-lined plate and leave as much of the drippings as you can in the pan. To the bacon fat, add the butter, onions, 1 tsp salt, and 1/2 tsp pepper; cook the onions until they are slightly softened, about 3-5 minutes. Whisk in the flour until smooth and allow the mixture to cook, whisking frequently, for about 2 minutes. Slowly whisk in the milk until no lumps remain. Reduce the heat to medium-low. Slowly whisk the milk mixture into the beaten egg, one tablespoon at a time, until the egg warms up, then whisk all of the egg-milk mixture into the saucepan. Add the ancho chile powder, cheddar and cream cheeses, and pimentos. Bring the mixture to a simmer, stirring occasionally, and allow it to simmer for 2-3 minutes or until thickened. Once thickened, stir in the bacon. Add salt and/or pepper to taste. Stir the drained elbow macaroni into the sauce until the macaroni is well-coated. Pour the mac and cheese into a medium bowl and chill until firm (overnight works best). To fry the mac and cheese, heat about 3 inches of oil to 350 degrees F in a heavy-bottomed, large shallow pot or Dutch oven. In three separate shallow dishes, place the flour, eggs, and panko breadcrumbs. While the oil heats, use a medium-sized ice cream scoop (mine is about 3 tbsp), to scoop chilled mac and cheese into 2-inch balls and carefully pat them into a round shape. Roll each ball lightly in the flour, then dip in the egg, then coat in the panko breadcrumbs. Set the balls aside on a plate while you finish the rest of them. Once the oil reaches 350 degrees F, carefully lower 3-4 balls into the hot oil. Fry for about 3 minutes each or until nicely browned. Remove them carefully from the pan and set them on a paper towel-lined plate to drain. Repeat with remaining mac and cheese balls. Oh my goodness!! I’ve always wondered how to fry mac n cheese… It’s something I’ve often thought of doing with the left overs. I’m going to have to give it a try. Josie will be honored that you went through the trouble of messing up all of your dishes for this delicious treat! 🙂 I’ve only tried a pimiento dip, never a cheese, so I would love to try this! Ever since Josie got me hooked on pimento cheese, I can’t get enough. This sounds too good to be true. As a pimento cheese-loving southern girl, I can assure you that you’ve done the dish serious, serious justice! Great, great job! I’ve never had pimento cheese either, but I can’t imagine I wouldn’t like this. After all, it’s mac and cheese, one of my favorite foods – and it’s fried! Yum! Yes, you definitely made the right choice! Just when I thought you couldn’t improve mac&cheese, you added pimiento cheese and deep-fried it – genius! I’d say you definitely did it justice – you damn Yankee! 😉 Can’t wait to hang out again – love you, lady!! Mac and Cheese variations are always fun, and this pimento fried version looks and sounds amazing! It’s wonderful how you all have made so many close friendships through blogging and come together to celebrate occasions such as this! If I was in that kitchen with you while you were doubting your choice, I would have said yes..you need to make something else! And surely I would have gobbled these up for myself. No..really…I am so glad you followed your first mind. This look so good! Definitely on my must try list! If I was in the kitchen with you while you was doubting your choice I would have told you that you need to make something else! Surely I would have then gobbled these gems all up myself!! Seriously Tara …they look so good and you made a great choice! I am glad you followed through with it! Oh my…these looks insanely delicious. I must make a small batch of these, otherwise I’ll gobble them all up! FANTASTIC contribution to Josie’s shower! Can’t wait to try these out! Please add a “like” and “share this page” to your website! You can mess up anytime if it looks like this. What a great idea! Thanks for shring. I’ve never had fried mac and cheese or pimento cheese, but this looks like the best way to kill two birds with one stone! Love this recipe! How much cheddar cheese is it? 1/2 lb? I think that got left off the recipe. I’ve never had fried mac and cheese, let alone fried pimento mac and cheese! What a winner of a thought you have here 🙂 And beautiful photos. I have never tried pimento cheese, but my understand is its pretty much cheese with peppers, right? Im game for that. And Ill try anything fried at least once. These look outstanding. These sound pretty delish! Great idea for the virtual party! What a fun idea! I made the Pimiento Mac and cheese this week from Bon Appetit – forgot to take pics though 🙁 It was great, so turning it into this would be amazing! OK. Not exactly health food, but it looks unbelievably scrumptious! I have made Bon Appétit’s pimento mac and cheese and it was amazing! 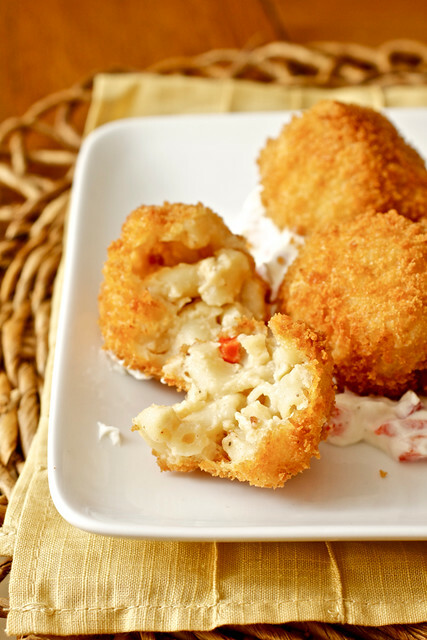 These fried mac and cheese balls are genius! I am going to have to try this. Thanks for sharing!! This looks so ridiculously good. I used to think I disliked pimiento, but I think that’s just because I didn’t like the olives they were stuffed into. lol! I love it now, but don’t get enough of it – especially in mac and cheese applications! Looks fantastic! I just ventured into the world of homemade pimiento cheese myself for an engagement party! I can’t wait to try these. I love fried mac & cheese balls (I get them from Cheesecake Factory, and love them!) Thank you!